2016 Atlantic hurricane season forecasts so far suggest more activity in the Atlantic tropics than seen in recent years and a greater chance of U.S. hurricane landfalls, as the transition to La Niña and warmer sea surface temperatures near the U.S. coast and in the Gulf may influence hurricane activity. 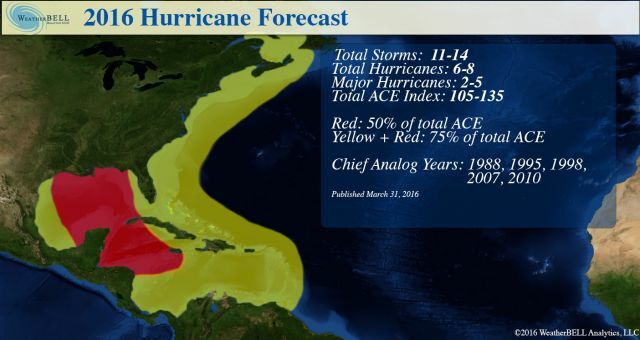 As Artemis reported last week, the first forecast from Tropical Storm Risks, the initiative supported by reinsurance broker Aon Benfield, predicts the formation of 12 named storms, 6 hurricanes and 2 major hurricanes in the 2016 Atlantic hurricane season. That’s already an increase on the 10 named storms, 3 hurricanes and 2 major hurricanes experienced in the Atlantic basin in 2015, but still on an accumulated cyclone energy (ACE) basis 20% below the long-term average (12, 6 & 3) and 15% below the recent 2006-15 average (14, 6 & 3) as well. 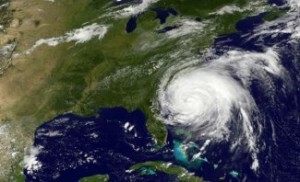 But additional forecasts from other respected meteorology sources deserve the attention of insurance, reinsurance and ILS funds, as they suggest that 2016 hurricane activity may be closer to or above the averages, and forecasters believe there are factors in play which could result in greater potential for hurricane landfall on the U.S. coastline than we’ve seen in years. With the insurance and reinsurance industries major peak catastrophe zone being the U.S. and hurricane risks among the largest potential loss drivers, as well as the catastrophe bond and ILS market remaining predominantly exposed to this peril (right now 61% of the outstanding cat bonds in our Deal Directory have some exposure to this peril), it is vital to watch the hurricane season as it develops in order to make effective hedging decisions where necessary. WeatherBell Analytics LLC, a highly respected forecasting and weather data outfit, point towards 2016 hurricane activity levels being roughly average, although perhaps slightly above on a storm count basis. WeatherBell forecasters predict 11 to 14 named storms, 6 to 8 hurricanes and 2 to 5 major hurricanes, with ACE ranging 105 to 135 for the season. WeatherBell expects the 2016 hurricane season will be a “more active season than last year” with factors such as the expected transition of El Niño into La Niña as well as the fact that the Gulf of Mexico and western Atlantic are both much warmer than in seasonal analog years (WeatherBell likens conditions to 1988, 1995, 1998, 2007 & 2010), potentially helping to boost activity. However, WeatherBell maintains that an unfavourable eastern Atlantic situation could prevent 2016 from being a particularly active hurricane year. “While the pattern setting up now has a huge high pressure in the eastern Atlantic (a known negative for high ACE), the warm water near the U.S. ups the ante for in-close activity. So we have to balance that in and come up with a more or less average number, but the worry is big storms in-close,” WeatherBell explains. With very warm sea surface temperatures in the Gulf of Mexico and near the U.S. east coast this year, and weather models forecasting high rainfall through summer and autumn, according to WeatherBell, we could be heading for another season where if a storm forms and takes aim for the U.S. it could easily intensify. Meanwhile, AccuWeather’s forecast for 2016 Atlantic tropical storm and hurricane activity is a prediction for 14 named storms, 8 hurricanes and 4 major hurricanes, so an above average season both compared to long-term and recent history. One factor that AccuWeather highlights as potentially dampening hurricane activity is an anomalous cooler area of SST’s in the norther Atlantic. 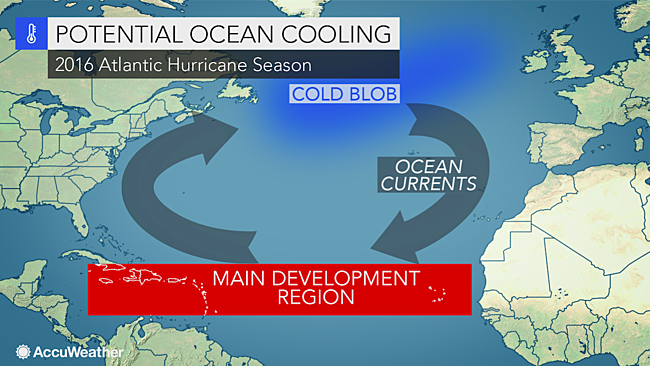 “Whether or not ocean currents draw cold water from this blob southward into tropical regions of the Atlantic could determine how active the season becomes. “If the cooler water migrates southward across the eastern Atlantic, then westward into tropical breeding grounds, it will lower sea-surface temperatures over the region where 85 percent of Atlantic tropical systems develop,” AccuWeather explains. And even should the eastern Atlantic cool further, the warmer sea surface temperatures in the Gulf of Mexico and along the U.S. eastern seaboard are important to note, as they could enable weaker storms to intensify, or for storms to form much closer to land during the 2016 hurricane season. You can track the 2016 Atlantic hurricane season forecasts and activity as the season begins over on our dedicated page. Based on the forecasts we currently have listed the average prediction for the 2016 hurricane season is for 13 named storms to form, with 7 becoming hurricanes and 3.2 becoming major hurricanes of category 3 or greater strength. If the forecasts are accurate that’s an above average season all in, even though the number of named storms is lower. 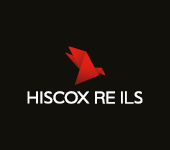 For the reinsurance and catastrophe bond or ILS market it is the number of hurricanes, or major hurricanes, and the probability of landfall that are the most important factors. “The big question is whether we will go into a La Niña, which is what we’re anticipating right now,” AccuWeather Atlantic Hurricane Expert Dan Kottlowski explained. In a La Niña year it is expected that the tropical development region of the Atlantic experiences less wind shear, which can increase the chances of storm formation resulting in a potential for a more active tropical storm season. “Historically, some hurricane seasons that have followed a transition from El Niño to La Niña have been very active. It’s possible we could flip from one extreme to the other, from below-normal seasons the past three years to an above-normal year in 2016,” Kottlowski said. So, 2016 could be the most active hurricane season in some years, based on these early predictions and the warm sea surface temperatures. With La Niña’s expected onset thought to signal more active tropical storm and hurricane activity, the meteorological stars could be aligning for a more impactful year as well. Keep up to date with our 2016 hurricane season page.